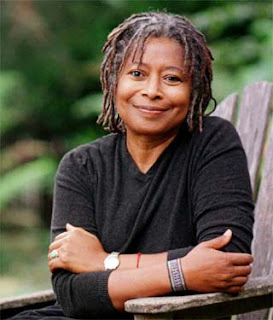 I recently came across this reflection by Alice Walker. It's from her book Everything We Love Can Be Saved. I think it is significant. "It has become a common feeling, I believe, as we have watched our heroes falling over the years, that our own small stone of activism, which might not seem to measure up to the rugged boulders of heroism we have so admired, is a paltry offering toward the building of an edifice of hope. Many who believe this choose to withhold their offerings out of shame. This is the tragedy of our world. For we can do nothing substantial toward changing the course on the planet, a destructive one, without rousing ourselves, individual by individual, and bring our small, imperfect stones to the pile." Few of us may ever qualify as rugged boulders of heroism. Photos of Gandhi hang on my office wall. The words and actions of Martin Luther King, Jr. are never too far from my consciousness. Books by activists and educators and faith-formed writers and witnesses who inspire me line my nearby bookshelf: Bonhoeffer, Romero, Mother Teresa, Tutu, Buechner, Manning, McKnight, Paton, Yoder, Snyder, Sider, Wallis, Wesley. These are, to me, rugged boulders of heroism. They inspire me, but whatever I am or do pales in comparison. Alice points out, however, how important it is for each us to add our stone--however small or rough or lightweight or incomplete or conflicted or seemingly insignificant--to the pile. The pile becomes the foundation for the edifice hope. Whether or not we make our own small resistances in the face of mass capitulation, lift our own broken voices amid deadly silence and sameness, and make our own creative contribution amid corporate and consumer co-optation is the difference in hope or despair for others, for the world and for ourselves. So, whether or not you think what you have to say or do will make much difference, say it anyway, do it anyway. Shake off the shame that shallow comparisons invariably, deceptively foment. We all need your voice, your action. Pick up the stone and heave it onto the pile. That's how hope happens.